The news of the death of the Mayor, Councillor George E. Slater, although not unexpected, came as a shock to the burgesses. His passing will mean a great loss in the town, for he was a good man. There was nothing showy about him. He did not excel in the art of oratory. But he was a man of sound common sense and singleness of purpose; he gave of his best for the town of his adoption. This was fully recognised by his fellow members on the town Council. When war broke out, and a difficulty arose in filling the office of Mayor, it was to him that the Council unanimously turned in its dilemma. Councillor Slater had already been through the chair, and the last thing he wished to do was to fill the office again. But the way it was put to him he felt it was his duty, for he had the leisure of a man who had retired from his business life. So he accepted. Again in November, 1940, and 1941, he was pressed to continue in office. He was loath to do so, as the burden was becoming increasingly heavy. He has died in harness, and there is no doubt that his duties took more out of him than he cared to tell his fellow members or his family. For he never spared himself; he was conscientious even in the smallest detail. No townsman ever had a more sincere tribute paid to him at his funeral. It was not the civic pomp, though that was fitting, but rather the presence of the best of humble people who came to say goodbye to a friend. It is with very great regret we record the death of Councillor G. E. Slater, Mayor of Newbury, which took place at his residence, “Riber” Queen’s-road, Newbury, late on Wednesday last week, ten days after his 74th birthday His Worship was taken ill with a severe heart attack on Sunday March 15th. After six weeks complete rest in bed, he made such good progress that he was to get up, and went for two or three short walks, though he did not venture down the town. Another seizure followed, and subsequent sharp attacks gradually weakened his strength, but all the time he put up a wonderful fight for life, and during the last week it was his will power that kept him going. Councillor George Ernest Slater was serving his fourth year as Mayor, and it may truly be said that he wore himself out in public work. He was a native of Matlock, Derbyshire, and came to Newbury in 1908. For 35 years he was in the service of the Prudential Assurance Company, 21 yeas as district superintendent, including 18 at Newbury. Upon retiring some 17 years ago, he showed that he did not intend to occupy his leisure unprofitably, for he immediately took up public work. He was appointed on the old Board of Guardians; co-opted on to the Borough Education Committee, and in March, 1928, he entered the Town Council. This was at a contested by-election, and he created a record in seat taking, for it was not until nine o’clock on a Monday night that he was declared elected, and at 10.30 next morning he was being welcomed at his first Corporation meeting. 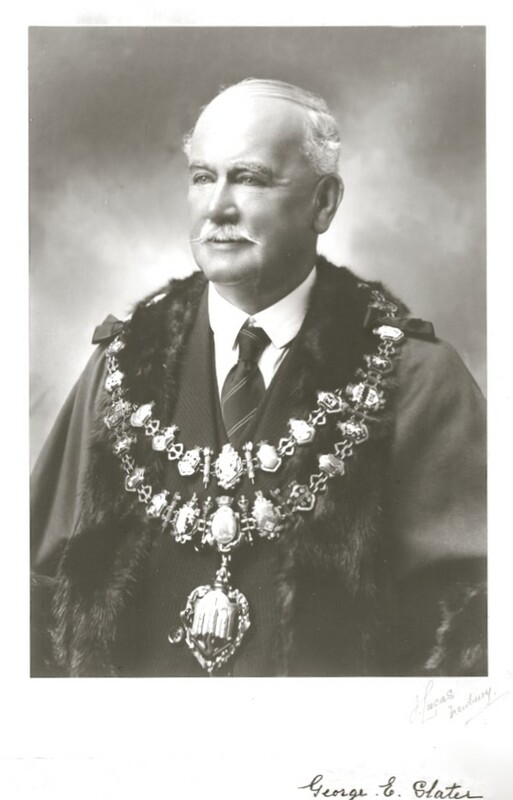 His main municipal work has been in connection with the education, highways, parking and pleasure grounds, housing and public health, and he was chairman of the latter committee for some time. Successful at every election he had to fight, Councillor Slater has been a most conscientious representative. He regarded everything as his duty, and carried out to the utmost of his ability. He had many likeable qualities. He radiated geniality and was incapable of saying an unkind word. He was unanimously chosen as Mayor for the first time in October 1937, became Deputy-Mayor the following year, and then, with the outbreak of the war, when difficulties arose to filling the office, at the express wish of his colleagues he again took up the duties of Chief Citizen of the Borough. His business training and experience stood him in good stead in carrying out the many duties of the Mayoralty, but it was his conscientiousness and consistency in sticking to his convictions and high principles, and his unflinching devotion to duty that induced the members to press him to continue in office for a third and a fourth year. It was certainly not of his own seeking, for modesty was a strong trait in his character. He was a s much at home with the old people at “The House on the Hill” on Christmas Day, or the children in schools at their breaking-up parties as at any other engagement. He often said, when told that he was “doing too much,” and it was noticeable that his public work was a severe strain even on a man of his strong constitution, that he was too old to take any active part in civil defence, and so, anxious to be as useful as he could, he regarded the Mayoralty as his “war work”. He did not spare himself. The trouble was that he could not be persuaded to rest, even when there was a chance to do so. A Mayor’s job in wartime is particularly arduous. He has to preside at meetings of the Emergency Committee two or three times a week; there are also council and innumerable committee meetings, besides a host of outside engagements. He is stopped by all and sundry who want advice and help. Councillor Slater never turned a cold shoulder to anyone. In fact instead of letting people seek him out to sign papers, such as applications for almshouses or for pensions, if it was someone who was ill or infirm, he would go to their houses to save them trouble. He never refused an engagement; never turned a deaf ear to an appeal. His meals were interrupted by callers who knew that they would find him at home and knew that he would listen to them. The strain and stress of the work during the past year told upon him. He often came home tired and weary, but with the consolation that he had done his duty. Apart from municipal work, Councillor Slater made time to engage in all kinds of other public service. He was a member of the Hospital Management Committee, honorary treasurer for many years of the Relief Committee, vice-chairman of the Berks Insurance Committee which meets regularly at Reading, and a manager of Newbury Savings Bank. He was the Council’s representative on the Municipal Charities and on the British Legion. His great hobby was gardening- he took an intense care and pride of his garden, which always attracted passers-by. His main recreation was bowls, and for some years he was Captain of the Newbury Bowling Club and he was also a county player. He won many trophies. In his younger days he was a good footballer and he never lost his interest or failed to support this sport. He was also fond of cricket. He was identified with the Westwood Club as a member practically since its foundation, and was honorary auditor of the club since 1924. He belonged to a strong Methodist family, and during his 34 years’ association with the church in Bartholomew-street he has been one of its chief pillars and has held many offices. He never minded taking on any task for the good of the church, and was just as happy erecting a platform for the Sunday School anniversary or decorating the church for the harvest festival, as in being a delegate to Synod or to a church conference. It was truly said of him at the Mayor-making ceremony last year that “he was a steadfast man: a man of the people, indomitable, imperturbable, a man who had faith in himself, in his fellow men, in his country, and faith in God.” He sang in the Newbury Methodist Church choir for 32 years, and he and his family often took part in duets or quartets. Only a short time ago he was asked to sing at a local Soldiers’ Club; he did not refuse. He was also a great help to the Newbury P.S.A. Fellowship, which he attended regularly, in addition to being at his own church twice on Sunday. Councillor Slater was twice married. In 1910 he married Miss Edith Griffin, only daughter of the late Alderman George Griffin, who was Mayor of Newbury for three years 1919-21. The greatest sympathy is felt for the Mayoress, and for the Mayor’s two sons and three daughters. At the Newbury County Bench on Thursday, the chairman (Colonel J.A. Fairhurst) expressed deep regret at the passing of the Mayor. He said the County Justices had always found him a most valued colleague, possessing very sound judgement and they tendered their sympathy with the members of the family. At the Borough Bench on Friday Councillor J.H. Thompson, who presided, said the town had sustained a great loss. He had known the Mayor for many years, and had found him unpretentious, generous and devoted to every good cause. During his residence in the town he had been a friend to many in need, and the magistrates desired to extend to the Mayoress and the family their sincere sympathy. The Council stood in silence and their Clerk was directed to send a letter of condolence to the Mayoress. Mr. Angus Marshall on behalf of the solicitors and advocates who practised in the court, said that the Mayor’s sense of judgement and high principles, and his earnest desire to help all those who were in need of help, had played an important part in the administration of justice in the town. Superintendent Lambourn, on behalf of the police, spoke in appreciation of the way in which the Mayor had always endeavoured to assist the police to the full, both day and night. Before the commencement of the morning service at the Newbury Parish Church on Sunday, the Rector (the Rev. Bertram Russell), in a short reference to the death of the Mayor (Councillor G.E. Slater) said they wished to show their respect and expressed sympathy with the deceased gentleman’s family. Councillor Slater had rendered exemplary public service and in these activities and in his Christian life had always acted fearlessly. The weekly meeting of the Newbury P.S.A. Fellowship, held in the Congregational Church on Sunday, took the form of an Appreciation Service. It was conducted jointly by the President, Councillor W.H. Bentley, and the Hon. Secretary, Mr. A.E. Reeves. Both spoke of the high esteem in which Councillor G.E. Slater was held by the whole community, and paid tribute to his sterling qualities and sense of high devotion to duty. They were fully conscious of the great loss the P.S.A. had sustained, in fact they felt they had lost not only a friend, but also a part of their foundation. Psalms xv and xxiii were read, and the hymns “I hear the voice of Jesus say,” “Abide with me” and “God be with you till we meet again,” were sung. The funeral took place on Monday afternoon at the Bartholomew-street Methodist Church, with which the Mayor had been closely associated for many years. It was a civic funeral, the Aldermen and Councillors attending in state wearing their robes, and the Town Clerk his wig. A short procession was formed from Market street to the Church, the members of the Council being preceded by the mace-bearers, the maces draped in crepe. Others taking part in the procession were the Rector of Newbury, Borough Justices, co-opted members of committees of the Council, town officials and representatives of the departmental staff at the municipal offices, members of the National Fire Service, officers of the Home Guard, members of the Berks Constabulary, and many others holding official positions in the town. The congregation was representative of townspeople in all walks of life, as well as many from the country. There was hardly an institution or organisation in the town which was unrepresented. There must have been close on 500 people present and many stood in the aisles at the back of the building. The service was conducted by the Rev. A. Russell Potts, minister of the church and chaplain to the Mayor, who was assisted by the Rev. A.S. Higson, who read the lesson, and the Rev. T. Haydn Wainwright who offered prayers. The hymns were “The King of love” and “In heavenly love abiding” while Miss Sheila Griffin, who was at the organ, played “Jesu, joy of man’s desiring” (Bach), “I know that my Redeemer liveth” (Handel) and “O rest in the Lord” (Mendelssohn) as the congregation assembled, and “Blest are the departed (Spohr) at the conclusion of the service. In his address, the Rev. A. Russell Potts said:”Fellow citizens of the Borough of Newbury, you have honoured, and will continue to honour, one of your chief citizens who has richly deserved the confidence you have placed in him. Though Councillor Slater hailed from Derbyshire, he soon became one with the people of Berkshire. He was so genial in manner that he endeared himself to all. Honour did not separate him from his fellows. It served rather to bring him into closer contact with everyone. The Mayoral chain was for him the golden chain of service, linking him with us all in the filial bonds of one . community. In the midst of the greatest honour, he was most humble. Ever ready to perform the lowliest service, he did not shirk the greatest responsibility. When the burden of his high office weighed more heavily upon him, he said that it would not have been British to give it up. The way of honour was for him the path of duty, and he steadfastly followed it all the way. The call of duty came to him, not as “the stern daughter of the voice of God”, as Wordsworth described it: but rather as the voice of God, without the sterner aspect. It was because he was readily responsive to that voice that his service became so devoted and extensive. “His citizenship had a spiritual centre and basis, in the life of his home and his church. His loyalty to his church never wavered nor diminished; not even under the pressure of his civic duties, extended as they were into the fourth year of his mayoralty. As a member of Bartholomew-street Methodist Church and choir, a Trustee and the senior Society Steward, he was constantly faithful, regular in attendance, and generous in his support and service. His church loyalty was equally extended to his membership of the Oxford and Gloucester District Synod. His spiritual life found its widest expression in his service to the community. From his Church to the Municipal Buildings and vice versa, was a pilgrimage which became symbolic of his life. He lived a devoted life, which was unified in all its associations. Some of the greatest qualities were perfectly blended in his personal and public life. Honour and humility, justice and generosity, cheerfulness and courage were all well balanced in his personality and character. His judgement was sound and impartial. He had the rare capacity for “poring oil on troubled waters” without lowering the standard of his principles. He was an asset to the life of the whole community. “Our loss is great; but our gain is greater. We have gained and will continue to gain, more than we can measure, through the abiding influence of abundant personal service, unstintedly given and a life so graciously lived. This was a man, the like of whom we may not look upon again. Yet if we could fulfil his most earnest wishes and attain his highest aims, we should face the future not in a spirit of lamentation, but in one constant attitude of dedication: to give and give and never count the cost, to live and work as sons of men and honour God the most. The family mourners were: Mrs. Slater, (wife), Mr. G.H. Slater and Mr. J.W. Slater (sons), Mrs. G.E. Willis, Mrs. R.H. Foster and Mrs. E.W. Howard (daughters), Mr. G.E. Willis and Mr. R.H. Foster (sons-in-law), Mrs. J.W. Slater (daughter-in-law),, Mr. J.S. Slater, Mr. F.H. Slater, and Mr. A.H. Slater (brothers), Miss Eileen Slater (grandchild), Mrs. H. L. Seward (niece), Mr. and Mrs. C.G. Griffin, Mr. and Mrs. A.V. Griffin, Mr. and Mrs. H. Griffin, Miss Jean Griffin, Mrs. H. Cooper, Mr. Eli Griffin, Mr. J.H. Foster, Mr. R.D. Griffin. The Deputy Mayor (Councillor G.G. Green) began the proceedings by stating that this was the first open meeting of the Council since the passing of their greatly esteemed friend and Mayor, Councillor George Ernest Slater. References had been made in various places and very suitably recorded in the local Press to Councillor Slater’s work in connection with all kinds of institutions and agencies. It rested with him to refer briefly to his work as Mayor of the borough and a colleague of their’s in municipal matters. Councillor Slater made no claim to brilliance, that was the last thing he would have suggested of himself, but, said the Deputy Mayor, “I cannot help feeling that we all agree that in his dealings with this Council as Chairman, he was kindly, courteous and tolerant – perhaps too tolerant at times, with some of us. I do not think that all that is in my heart and yours could be better expressed than by the fact that he was a good man, a man whom we all esteemed and admired, just because of his goodness and one could pay no higher tribute of any man or woman than that. It was said of One who went before him that “He went about doing good.” Councillor Slater all through his life in some form or other went about doing good, and spreading the seeds of kindness. I am quite sure it will always be said of him “He served his day and generation well, especially the town of Newbury and this Council. Councillor J.H. Thompson, seconding the resolution, said it had been his great privilege for many years to have known Councillor Slater and to have enjoyed a very intimate friendship. It was a personal loss to him and a very precious memory. The Deputy Mayor had referred to Councillor Slater’s activities on the Council, he was sure every member agreed with every good institution. Beyond the Council Chamber, there were very many who would have a gracious remembrance of him and those acts of kindness and love to which Councillor Green had referred. It was delightful to know a man who had left so much fragrance in the borough. Councillor Thompson associated himself with the expression of deep sympathy with Mrs. Slater and her family. They hoped and prayed that in this hour of bereavement and trial, consolation and the sustaining power of the Divine Comforter would be granted to them. The Town Clerks (Mr. S. Widdicombe) said how much the officers of the Council deplored the death of the Mayor. It had been their privilege to have associated with him very closely for a long period, and particularly during the time of war. They had worked under and with him in all kinds of circumstances, and had seen the innumerable acts of kindness which he did for others. They would not soon forget him. They would remember him in the words of the Deputy Mayor, that “he was a good man.” Mr. Widdicombe said he always felt that Councillor Slater was a man who brought real Christianity into his life. He was a man of fine character, delightful modesty, which he thought, were only excelled by his devotion to duty. His memory would live with them for a long time as an inspiration to do whatever they could for the good of their town, and in these difficult days, for the good of their country. The resolution was carried, the members and all present standing in silence.